Atlantic Monthly Press, 9780802125446, 288pp. Patrick Hoffman burst onto the crime fiction scene with The White Van, a bank heist thriller set in the back streets of San Francisco and a finalist for the CWA Ian Fleming Steel Dagger Award. 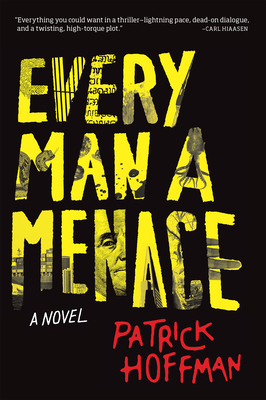 Now he returns with his second novel, Every Man a Menace, the inside story of a ruthless ecstasy-smuggling ring. San Francisco is about to receive the biggest delivery of MDMA to hit the West Coast in years. Raymond Gaspar, just out of prison, is sent to the city to check in on the increasingly erratic dealer expected to take care of distribution. In Miami, the man responsible for getting the drugs across the Pacific has just met the girl of his dreams--a woman who can't seem to keep her story straight. And thousands of miles away in Bangkok, someone farther up the supply chain is about to make a phone call that will put all their lives at risk. Stretching from the Golden Triangle of Southeast Asia to the Golden Gate of San Francisco, Every Man a Menace offers an unflinching account of the making, moving, and selling of the drug known as Molly--pure happiness sold by the brick, brought to market by bloodshed and betrayal. Patrick Hoffman is a writer and private investigator based in Brooklyn. His first novel, The White Van, was a finalist for the CWA Ian Fleming Steel Dagger Award and was named a Wall Street Journal best book of the year. He was born in San Francisco and worked there as an investigator, both privately and at the San Francisco Public Defender's Office.